Description: This monument, marking the grave of Jesse Franklin, takes the shape of a roughly-cut stone marker housing a bronze plaque. Franklin shares a 7' by 7' plot with Joseph Winston. Dedication date: Fall of 1906. Materials & Techniques: Granite and Bronze. 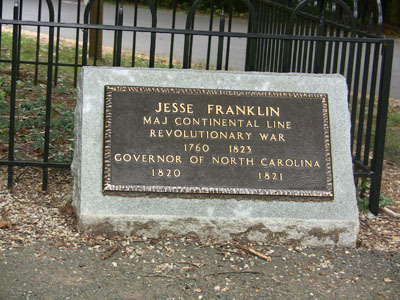 Subject notes: Jesse Franklin was born in 1760 in Orange County, North Carolina. He served as a major during the Revolutionary War, most notably escaping after capture by Tories and later fighting in the Battle of Guilford Court House. Franklin later served in the U.S. Senate between 1799-1805 and again from 1807-1813. He was also Governor of North Carolina from 1820-1821. He died in 1823 in Surry County, North Carolina. Former Locations: His body was moved in 1906 in an effort the reinter as many great Revolutionary heroes as possible to the the Battleground. Landscape: Jesse Franklin's grave is in a plot with Joseph Winston.